Leaving Glasgow behind we head west, crossing the Firth of Clyde, where there are wonderful views of Dumbarton Castle, famed for its connections with Mary, Queen of Scots and William Wallace, the real Braveheart!. 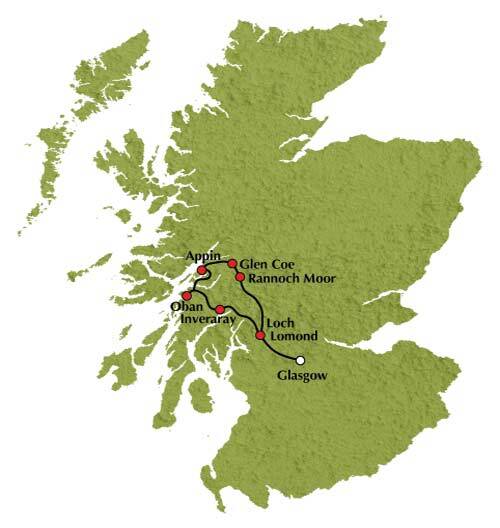 Our journey northwards from Glasgow takes us to Loch Lomond. Look out for "The Cobbler”, just one of the peaks of the "Arrochar Alps”. We then enter the Argyll Forest Park and start our ascent of the dramatic "Rest and be Thankful” pass. Inveraray is a quaint small town built in the mid-18th century, on the shore of Loch Fyne. Here we can choose to visit Inveraray Castle * (April - October only), the historic home of the Duke of Argyll, Chief of the Clan Campbell, which is nestled in large beautiful gardens overlooking Loch Fyne. Alternatively, explore the town's white-washed Georgian houses, wide streets and enjoy views across the shores of Loch Fyne. We journey north and pause to admire the spectacular Kilchurn Castle, majestically situated on Loch Awe, and beautifully framed by mountains. Shortly we make the descent into the fishing town of Oban, the gateway to the Hebrides. This picturesque town sits overlooking an attractive horseshoe bay which is best viewed from MacCaig's Folly, an unfinished tower that sits overlooking the town on Oban Hill. After spending time in Oban we head for Appin and Benderloch. Look out for 15th Century Castle Stalker, which is set on a little island on Loch Laich. The grandeur of Glen Coe is our next treat. This remote and wild valley was the setting for one of the most notorious events in Scottish history. In 1692 some 40 members of the resident MacDonald clan were brutally murdered by Campbell troops. You’re sure to get a shiver of the spine when you step off the coach to soak up the beauty of this very special place. The vastness of Rannoch Moor leads us to our descent of the "Black Mount” and onwards to romantic Loch Lomond. Our last stop of the day is in the picturesque conservation village of Luss where you'll have a chance to discover the "bonnie, bonnie banks” for yourself! From Luss it's just a short drive to journey's end in Glasgow. · Live commentary in English.